In the mid-20th century, African Americans launched a renewed struggle to claim the civil rights that had long been denied to them. As they moved to end racial segregation, they called on the nation to live up to its ideals of freedom, equality, and democracy. Through peaceful yet determined action, they brought attention to injustice, achieved major victories, and inspired other groups to mobilize for equal rights. On February 1, 1960, four African American college students protesting segregation entered a Woolworth’s store in Greensboro, North Carolina, sat down at this “whites-only” lunch counter, and politely asked to be served. When their request was denied, the students refused to leave. For six months, students and supporters staged a sit-in protest and boycott of the store. 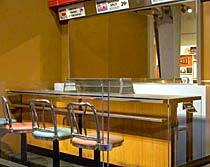 In July 1960, the Woolworth’s lunch counter was desegregated. A watershed event in the civil rights movement, the Greensboro sit-in led to similar protests across the South.